Have you noticed that cool wallpaper has made a huge comeback and now continues to gain popularity? 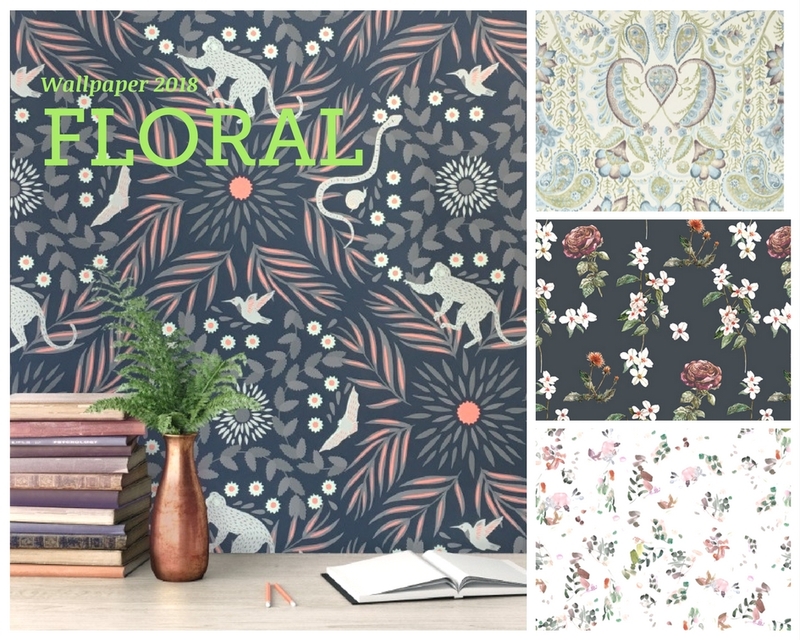 I personally love wallpaper, and 6 years ago when my husband and I moved into our home I tried to make a solid case for wallpaper in our dining room, but he just wouldn't go for it. I get it though, the idea of removing wallpaper can be daunting. If it's in good shape, you don't actually have to remove but rather paint over it. There are also some stick-on alternatives I didn't know about six years ago. I digress, in this video, I answered Jen's question about where she can get cool wallpaper and how to hang wallpaper when you have very tall ceilings. First Jen, I wanted to say thank you for the compliment on the wall behind me, but it’s actually not wallpaper. This is the wall I wanted to wallpaper, but I ended up hand stenciling instead. It took me a long time to do and to be honest when I think about changing the pattern, I think wallpaper will be easier. podcast called A Well-Designed Business and was really intrigued by the designer's process of finding inspiration for her designs because it sounded very familiar to my own approach to making art and design. Take a look at Kravet, Alpha Workshop, and Brett Design.They all have beautiful and unique designs that will definitely impress your guests as well as make you happy every time you come home. When I was collecting wallpaper sample pictures for this, I had to stop myself. There are so many cool wallpaper options I could have spent all day happily saving photographs. It was tough to narrow it down the few I've mentioned here, but I didn't want to overwhelm the issue at hand. Some trends in home decor and wallpaper that I'm seeing right now included intricate patterns and florals like chintz. Geometric is still going strong. Designs inspired by Fine Art and tropical patterns like we were seeing in fashion last summer, along with 80's inspired designs. For color, pastels are big so lots of pastel pink, similar to millennial pink, greens in pistachio and lettuce. They say black and white is out in favor of dark blue and white but I think both are classics and you can’t go wrong. These are just trends I thought I’d mention. I think trends are interesting because they often reflect what is going on in society. I’d say, in general, if you choose something that is considered trendy, make it something you’ve always liked anyway. Like for me, I’ve always loved blue and white ginger jars. Years ago I set out to coordinate all my houseplants in blue and white pots, and now ginger jars are having a moment of popularity. So if I chose a blue and white wallpaper, it’s reasonably safe to say I’ll still like it ten years from now. When it comes to hanging wallpaper on high walls, I would say that your best bet is, of course, to hire a pro. We all have much better things to do, and there are much more skilled people out there who can do the job for us better and quicker. I know that’s an obvious answer but honestly, wallpaper can get pricey, and I would never suggest it to someone who doesn’t consider themselves to be very handy. Being up on a ladder, really high, straining your neck, can be a little dicey, and I know that from the experience of painting murals when I first got my business started. If you are someone who wants to do it yourself, you’ll need to do a lot of planning, and you’ll need the assistance of a second person. If your ceilings are vaulted, you’ll start with the tallest section of the wall first. Have your assistant help you with the wallpaper as you go up the ladder and then hold the ladder securely while you work. Move the ladder to the next section of wall and repeat. That’s just my super brief summary you can find a lot of good tutorials online and defiantly talk to the person you are buying the paper from about the best way to paste and hang it. If you want help choosing a cool wallpaper for your home let's talk about it Contact Me.